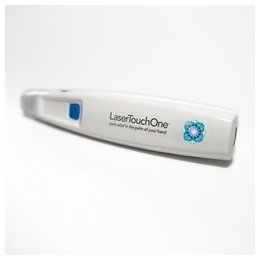 The Laser Touch One Low Level Laser Therapy Device is an FDA approved clinical-grade pain management tool that combines the therapeutic benefits of both laser light and micro-current electrical stimulation therapies into one convenient handheld applicator. Clinical research has shown the combined effect of these two therapy systems benefits muscle tissue at the cellular level and helps to promote the body’s natural healing processes. With the combination of low level laser, or cold laser, therapy (LLLT) and microcurrent electronic nerve stimulation, the LaserTouchOne treats pain at the source, providing effective, lasting relief from both chronic and acute pain. Microcurrent electrical stimulation is a million times lower than a “TENS unit” (so no prescription is needed in this case) and this low frequency more closely matches the body’s own electrical frequency for optimal healing. This portable and ergonomically designed handheld laser therapy device provides easy, effective and self-treatment without medication. FDA approved for effective pain management, the LaserTouchOne provides ergonomic, portable and reliable pain relief right from the palm of your hand.